A heavily pregnant woman who was filmed hitting her baby bump with a claw hammer is set to flee her Birmingham home because of the backlash, sources claim. 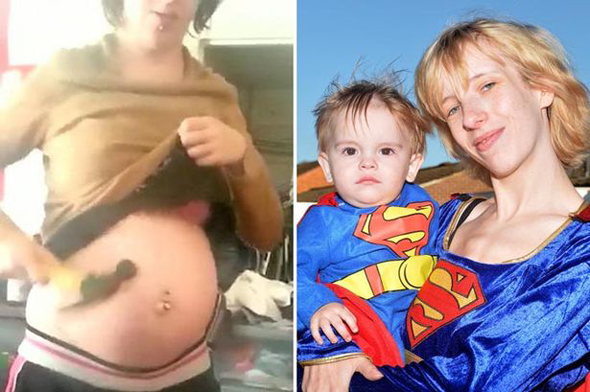 Shock video footage apparently showed Heather Thorpe, 24, striking her stomach with the tool weeks before she gave birth to Jonathon, who turned one last week. Now she and her family are said to be preparing to quit their Chelmsley Wood home to escape abuse sparked after the five-second clip was posted online. 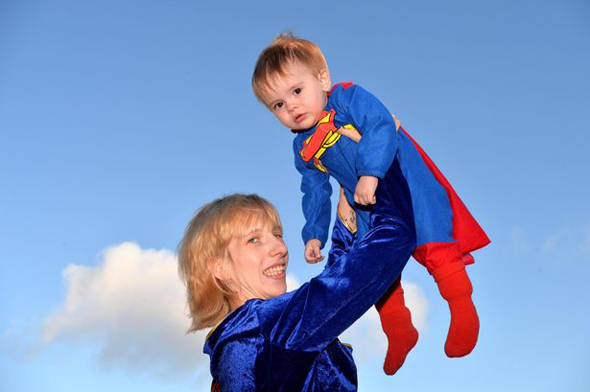 Heather appeared in the Birmingham Mail last week posing with Jonathon in matching Superman and woman outfits to mark his first birthday. She claimed he was a "superbaby" as he could already read, walk and talk. The film was released by her former partner, Sean Hanlon, who said he recorded the footage on his iPhone around a month before Heather's due date. She hit her stomach with the hammer to prove how hard her unborn baby was, he claimed. A spokesman for West Midlands Police said a "thorough" investigation had taken place, but no action was taken. "A report was received in December 2012 from a member of the public regarding video footage of a pregnant woman self harming," the spokesman said. "A thorough investigation was undertaken by police and no criminal offences were found. The matter was referred to local adult and child services." The video shows Heather grabbing the steel claw hammer, lifting her top up and seemingly delivering two blows to the side of her stomach. Mr Hanlon, a security guard from Lea Village, said he was shocked by the incident but claimed when he remonstrated with his then girlfriend she told him to stop 'over-reacting'. Heather and her family declined to comment when contacted by the Birmingham Mail.